We all know how expensive bookbinding leather can be, buying a whole skin when the price per sq ft is £18.00 plus, is no joke, particularly as sometimes all you need is a part skin. We have started obtaining large goatskin bookbinding leather offcuts and second quality skins, and thought we would share them with you. All the leathers are fully vegetable tanned. Many are genuine, shrunk grain Nigerian goatskins. These leathers are produced in Northamptonshire, England - an area traditionally associated with the production of leather and leather goods. The whole skins are between 5 & 7 sq ft. The leather offcuts total between 6 & 7 sq ft. They vary in substance from between 0.8mm & 1.2mm, leather offcuts may be a mixture of these wieghts. 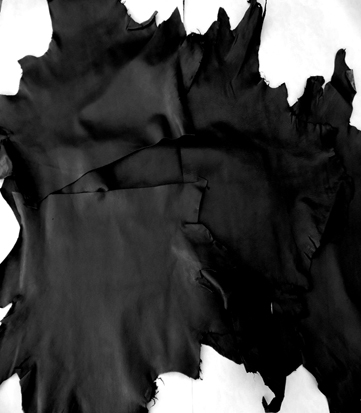 The goatskin leather offcuts are not small pieces, as the picture below shows. 7 sq ft Nigerian goatskin leather offcuts. Good for small full leather bindings, or any number of quarter and half leather bindings. We also get small quantities of other leathers which we sell cheaply. Drop us a line if you are interested. Here is a selection of the skins we carry, colours may vary from one month to the next. Thank you Richard! more lovely than I possibly imagined!!!! These are good quality skins at an unbelievable price. Sorry there are no sample cards for this leather. We cannot undertake to supply particular colours, but we can undertake to contact you if the colour becomes available. Supply of this leather is limited, we can only obtain about 30 skins, and about the same in off cuts every month.